Authors, professional writers and literary meet organisers from neighbouring states and Bhutan have converged at the 42nd International Kolkata Book Fair for a two-day literary event, starting today. 'Shabd - Where Literature Meets', jointly organised by the Kolkata Literature Festival (KLF) and Prabha Khaitan Foundation (PKF), is aimed at creating a platform for celebrating and promoting literary works in regional languages, a statement issued by the organisers said today. Every year, more than 20 popular literature festivals are held across different cities of India but these exchange programmes do not adequately represent regional literature, the statement said. "Our vision is to explore newer possibilities and collaboration, especially in promoting and popularizing regional literature and culture, by providing a meaningful platform for holding Literary Exchanges Programmes (LEPs) across India," said Sundeep Bhutoria, the trustee of Prabha Khaitan Foundation, a Kolkata-based NGO engaged in various social and cultural activities. More than 20 well-organised literature festivals are held across India every year and most of them have a bias towards English literature, he said. "Many regional literature festivals, on the other hand, lack organisational capacity and finesse to popularise their events and reach out to the masses. What is needed is a balance between the two and Shabd is an initiative that will try to address this," Bhutoria added. 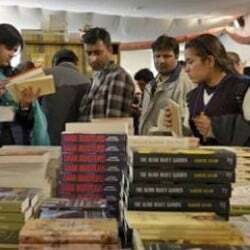 The 42nd edition of the book fair, organised at Central Park in Salt Lake area of the city, was inaugurated by Chief Minister Mamata Banerjee on January 30 and will conclude on February 11.